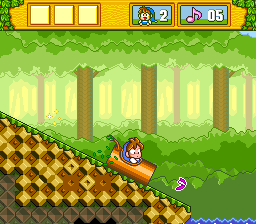 Romhacking.net - Review - Thanks for translating this delightful game! 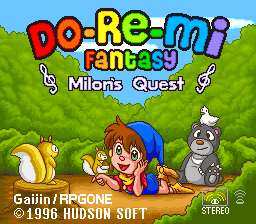 Jonny of RPGONE took it upon himself to hack Gaijin Productions’ Do-Re-Mi Fantasy patch and complete it. The resulting new patch translates everything Gaijin’s did, as well as all of the remaining compressed graphics including title logo, world names, menus and mini game text. 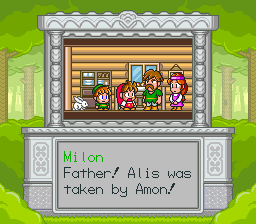 A new ending has also been created which appears after you beat Amon. Thanks for translating this delightful game! This translation feels really well-done! 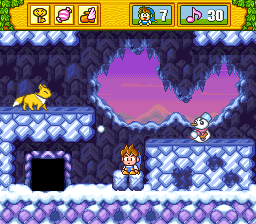 Here’s a glitch I encountered, though - on this minigame screen (http://i.imgur.com/JlArRyk.jpg), upon pressing the A Button, the scrolling background freezes and I have to reset the game. 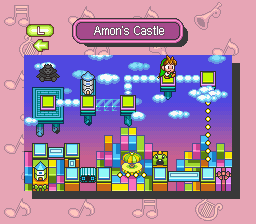 I was playing through on an SD2SNES, though, so I imagine this glitch doesn’t happen in emulators. Definitely worth checking this game out, the sound design is phenomenal!